Rough caps over smooth acorns; bumpy pine cones; round, smooth freshly picked apples; crunchy, crackling leaves; cozy wool socks signifying an end to the barefoot days of summer: these, to me, are how fall feels. I wanted to share these feelings with my boys, and have them focus on their sense of touch with these objects. I gathered our supplies- acorns, pine cones, an apple, a handful of leaves, a pair of socks, 5 bags and a bandanna to use as a blindfold. I wrote the word “Fall” on each bag. This game was one of those great games that can be tailored by age group, so that both of my boys had an equal amount of fun with it. 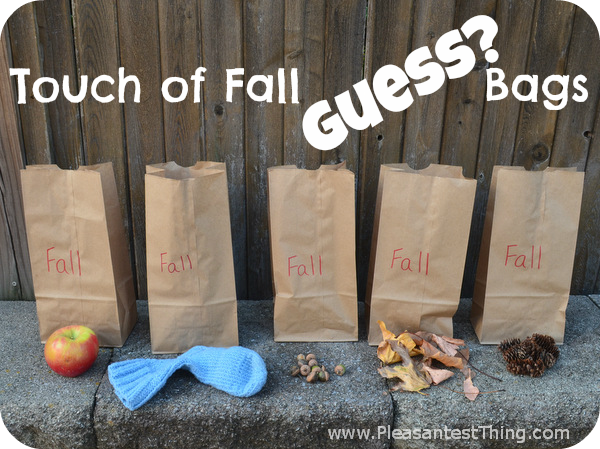 Preschooler: My son read the word “Fall” on each bag. He’s still a pre-reader, recognizing certain words he sees repeatedly, including some of the -all family. He was beyond thrilled when he could read the word on each of the bags. 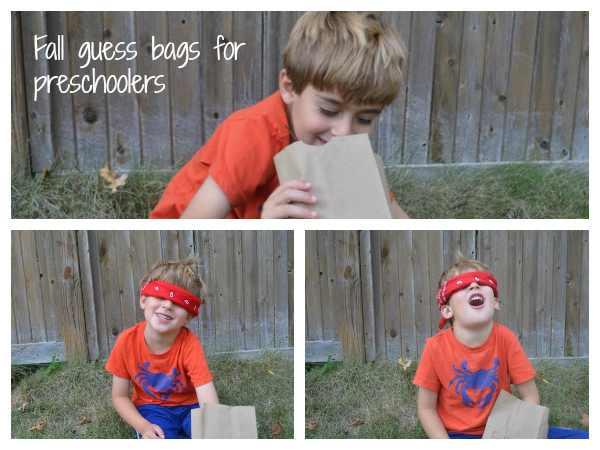 I blindfolded him, and he reached his hands in and felt inside the bags, giving me his guess as to what was inside. Then he pulled the object out to see what was actually in the bag and we talked some more about it- how it felt, other things that feel similar (he thought the pine cone felt like tree bark and the leaves reminded him of paper). Baby: My 14 month also enjoyed reaching into the bags and pulling out the objects inside. He had absolutely no interest in being blindfolded, but he insisted on having a bandanna around his head. As my baby pulled objects out of the bags, my older son and I described how each one felt to us. 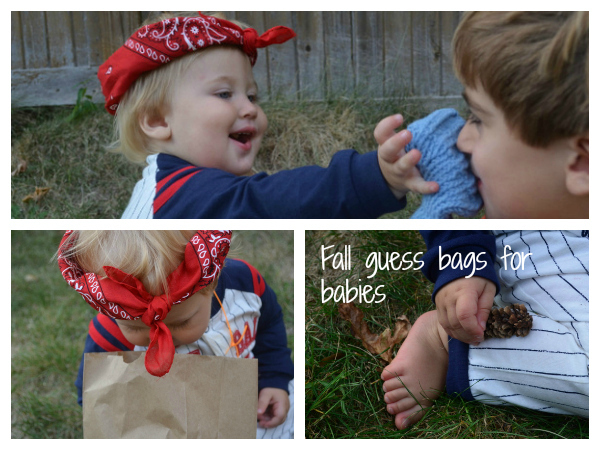 My younger son turned the fall objects around in his own hands, and then handed them to his big brother. For very young babies, no bags would be necessary- you could just help them explore the feeling of the objects (reminder to watch the little ones very carefully- especially if you are using small objects like acorns). When we finished, the boys decided on a perfect autumn snack- an apple!